Cameron has defended the decision to suspend Sir Malcom Rifkind following two of Britain’s former foreign secretaries were secretly filmed offering their services to private companies in return for cash. 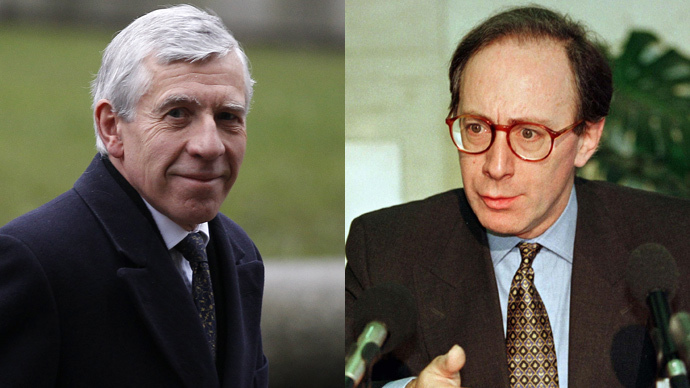 Jack Straw and Sir Malcom Rifkind were duped by reporters from the Daily Telegraph and Channel 4 who posed as staff for a Chinese firm, looking to gain access to politicians and senior establishment figures. The men were caught on camera offering access to high profile figures in exchange for cash. David Cameron has defended the decision to suspend Rifkind, saying the allegations were serious, and an investigation would begin immediately. “These are very serious matters" he said, "we have, rightly, very clear rules in this country which is MPs being paid to lobby – that is not acceptable, that is not allowed under the rules. It is right that Jack Straw and Malcolm Rifkind have referred themselves to the parliamentary commissioner, to have themselves investigated. “It is also right that, in both cases, while that happens the party whip should be suspended and that is what will happen with Sir Malcolm Rifkind as well as with Jack Straw. Obviously in Sir Malcolm’s case he is still a candidate at the next election so there will be an immediate disciplinary enquiry by the Conservative party to look at this case" he added. Former PM Tony Blair, however, defended his Foreign Secretary saying he was a "byword for being a hard-working constituency MP and parliamentarian". Straw was reportedly heard to say he worked “under the radar” to try and influence EU rules on behalf of a firm which paid him £60,000 per year, while Rifkind said he could gain “useful access” to British ambassadors across the globe. Rifkind, the Conservative MP for Kensington, claimed to be self-employed, despite earning an MP’s salary. The former foreign secretaries’ actions will be scrutinized by their respective parties, with Straw being immediately suspended from the Parliamentary Labour Party at his own request and Rifkind also being suspended from the Parliamentary Conservative Party on Monday afternoon. If, following investigation, Rifkind is found to be unsuitable to stand for election, the Conservatives face losing one of their safest seats in the country. Rifkind staunchly denies the claims, telling the BBC the allegations did not affect his role as chairman of Parliament’s Intelligence and Security Committee, which oversees the work of the security services. He further told the BBC the allegations were “unfounded” and he had “nothing to be embarrassed about.” He claimed the conversation caught on film was a “preliminary” discussion and he had not accepted any offer from the firm. Rifkind admitted, however, that it was “silly” to say he was not paid a salary. “Of course I receive a salary as a Member of Parliament but I was referring to my business interests, from none of which I receive a salary. I receive payment for services I provide,” he said. Straw suspended himself from the Parliamentary Labour Party, who said they are aware of the “disturbing allegations” made against him. Both men say they have requested transcripts from Channel 4 and the Telegraph, but have not received them so far. Channel 4 added that many of the politicians approached did not respond. The documentary, called Politicians for Hire, will be broadcast on Channel 4 at 20:00 GMT on Monday.